Bring your passion and talents to the world. Career Services and CASNR work together to provide information on agriculture and natural resources careers, student jobs, internships and full-time employment. We have a full-time staff member, Julie Obermeyer, ready to answer your questions and help you navigate your future. Come and experience what difference CASNR makes for your career. Julie Obermeyer, CASNR Career Development & Corporate Relations Director staffs the Career Services East office in 303 Nebraska East Union. Contact Julie at (402) 472-8273 for assistance or to schedule an appointment. Career Services on City Campus is located in 230 Nebraska Union. Walk-ins are available M-F 10-4 or call (402) 472-3145 for an appointment with a Career Counselor. Every year, we promote our quality CASNR students with Career Fairs that are geared to your specific interests in Agricultural Sciences and Natural Resources. Internships and work experiences are an integral part of your CASNR experience and we have great relationships with the companies and organizations that employ our graduates. Employers representing companies from around the world come to CASNR career fairs, because they know our graduates are among the best, most qualified in the nation. The College guarantees that any CASNR graduate who completes the Ensuring Your Future program and actively seeks employment will receive at least one job offer relevant to his or her academic program within the first six months after graduation. If you do not receive at least one employment offer, the College will pay for any course that is documented by an employer who interviewed you and found your degree program lacking critical elements. Career Services will administer an active resumé referral service, post job openings, provide help with resumé preparation, and prepare you for interviews with employers who are recruiting UNL students. The College of Agricultural Sciences and Natural Resources offers two career-related courses - Employment Seminar and Job Survival. The Employment Seminar is an eight-week one credit course which is open to all majors and class standings that provides assistance in various skills including: resume and cover letter development, interviewing skills, job search strategies and dining etiquette. The Employment Seminar will meet in person twice and online for the first eight weeks of the fall semester. Job Survival (AGRI 496) informs students on how to not only survive but thrive during the first year on a job. This course is taught by employers and discusses topics including 401K, benefits, investments, relocation and housing, communication within and outside of the office and advancement opportunities. This course is taught during the first eight weeks of the spring semester, is one credit, open to all majors and all class standing, and is held on Tuesday evenings in the Nebraska East Union from 4-5:50pm. 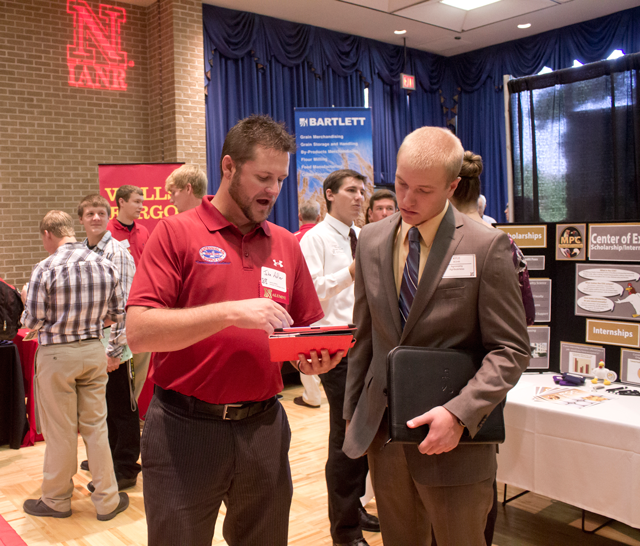 Handshake is UNL's on-line connection between students/alumni and employers hiring for part-time, internship and full-time positions. Hankshake is a free service for current UNL students and alumni. It's easy to create your account then post your resume, search employers and listings, request on-campus interviews and stay updated on career opportunities and events. Our staff helps students in all majors and colleges make academic and career decisions, gain experience and pursue employment or further education.